Stay up to date with all the comings and goings in the transfer window with CNN.com’s daily wrap of the latest rumors and gossip from Europe’s sports pages. LONDON, England – The ripples from Kaka's rejection of Manchester City's advances continue to travel far and wide, with the world's media chewing over the detritus of the deal. 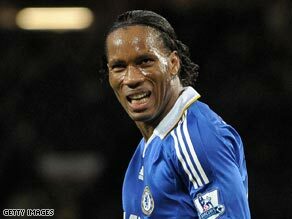 Didier Drogba: Set to become a City gent? The Guardian asks whether the Abu Dhabi United Group's failure to sign Kaka sounds the death knell for future big name signings, whilst others conclude that the Gulf royal family has been taught a humiliating lesson in political maneuvering. Corriere dello Sera, for instance, has reported that Kaka lambasted City's delegation for not having a clue what was going on and failing to table a bid in their six hour meeting with his representatives. So you would be forgiven for thinking City would lower their sights and ambitions. Not so. Thursday's papers brim with fresh targets to sooth City's hearts after their very public jilting with The Times reporting that Barcelona's Thierry Henry is again on the club's radar. After a difficult start to his time at the Catalan club Henry has begun to shine and has been instrumental in Barcelona's dominance in La Liga this season. But £10 ($13.89) million might just be enough to capture the Frenchman. They may need the firepower. City's absent Brazilian international, Robinho, is being lined up by his former national team boss Luis Felipe Scolari at Chelsea. City would be foolish to sell their prolific striker, you may think, but according to The Sun Didier Drogba could well be heading in the other direction. Which, on the face of it, would keep both sets of fans happy. One of Europe's hottest properties appears to have made his mind up as to where he will play for the rest of the season. German under-19 striker Savio Nsereko has been in rich form for Serie B team Brescia. So much so that Arsenal, Barcelona and West Ham have all been reported to be close to a deal to clinch his signature. But according to La Gazzetta dello Sport he will actually sign for Napoli instead. Over in Spain, next summer's presidential election at Real Madrid sees the usual round of crazy promises being made by the various candidates. And they don't get any more outlandish than the claims of former president Florentino Perez. After already claiming to have a promise that Ronaldo will join him at the Bernabeu, El Mundo has reported that he has also apparently reached a secret deal with Silvio Berlusconi to take Kaka to Madrid whilst also securing the services of Arsenal's Arsene Wenger. Which all seems rather far fetched. But with Wenger becoming increasingly frustrated with Arsenal's miserly transfer policy – the club's bid for Andrei Ashavin has hit the rocks after failing to meet Zenit St Petersburg's valuation, according to the Daily Mail – and Perez having a reputation for securing previously unthinkable transfers as he did by signing Luis Figo from arch rivals Barcelona, maybe it's worth taking notice. If you want to read more football news and features, and have YOUR say, go to CNN's Football Fanzone.